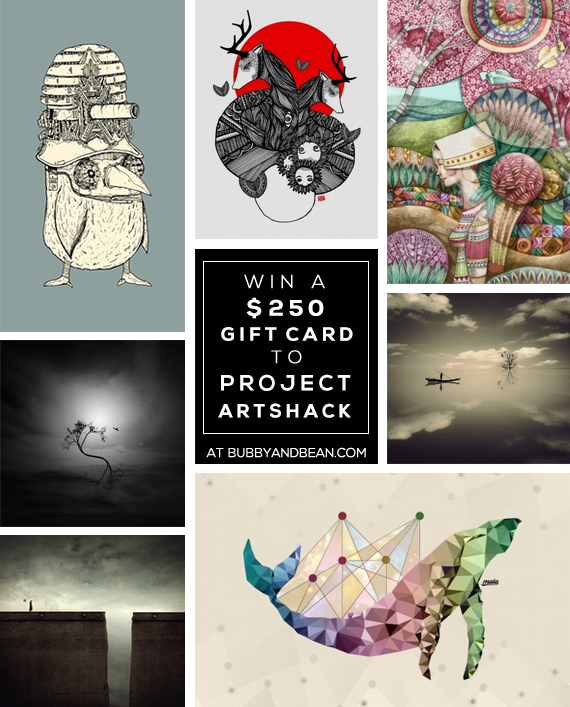 Bubby and Bean ::: Living Creatively: GIVEAWAY // Win a $250 Gift Card to Project ArtShack! Today I'm teaming up with August's featured sponsor, Project ArtShack, for a truly wonderful giveaway! For those not yet familiar with them, Project ArtShack is an online gallery that features a curated selection of gorgeous art from Southeast Asia’s emerging artists. My favorite thing about their company is that when you buy art from them, you are directly supporting and empowering the artists themselves - and giving them opportunities to create more art. Project Artshack offers hundreds of beautiful prints produced using the highest quality inks, papers, and canvases available, at reasonable prices. I personally have several pieces on my list for when we finally redecorate our bedroom walls this fall. And now for the best part: one lucky Bubby and Bean reader will win a $250 gift card to go shopping for artwork on Project ArtShack's website! This is the perfect excuse to redecorate your home, to grab early holiday gifts for friends or family, or just to pick out some beautiful new pieces of art for yourself. This giveaway will run through August 12, 2014 and is open to Bubby and Bean readers with shipping addresses in the U.S. or Canada. The winner will be randomly chosen and announced here shortly after. Thanks again to the kind folks over at Project ArtShack for giving Bubby and Bean readers the chance to win a gift card to their incredible online gallery! Good luck! Above artwork by: Jose Alfonso Y. de Vera, Daniel Tinagan, Yo Choowa, Đình Điệp, Michael Vincent Manalo, Aaron Saguinsin Baltazar. I have three favorites. All are by Spider Money. Glory & Gore, Angel of Death, and Kiss of Death. Those prints are amazing and I could easily see them on my bedroom wall. Thanks for the chance! They are so many I love but my favorite is Complex Constellation! "The Underwater Apartment" by Michael Vincent Manalo is just breathtaking. I adore the Complex Constellation! I love everything by Michael Vincent Manalo! The Underwater Apartment is my favorite. I love the one summer day print. Agent Oso is so cool! I love Blossom by Phan Thanh Dat! I love "The Boy Who Flew in a Boat" it reminds me of a book that my son loves. Love that print at the top in the middle! Checked out their beautiful site and I'm really into photographs by Thai artist Yo Choowa, especially Prelude. It was a super difficult decision to make but I really love the Yo Choowa birds artwork. I like a lot of collections, but I think practical for my home, I'd probably pick Yo Choowa. I really like the prints a lot. I cannot stop starting at "Bewilderment" by Michael Vincent Manalo. It's gorgeous. Co-founder of Project ArtShack here. Thank you so much for all your love! We really try our best to bring best artworks from emerging artists of Southeast Asia. Really happy to see you love them. I will relay your comments and love to our artists too. So many unique pieces! I'm would say Little Spring as my favorite.